Teslin® cardstock has excellent printability and is perfect for Security Cards, national ID cards, voter registration cards, police ID cards, border crossing cards, drivers licenses, visas, gun permits, prepaid phone cards, etc. Depending on the requirements, total security document systems (inclusions, OVDs laminating film, etc.) 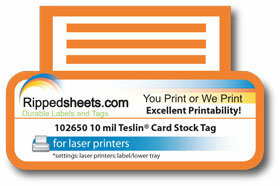 that use Teslin® sheets are equal to or better than any system yet invented. All things considered, documents created on Teslin® sheets are substantially lower in cost than security documents produced using competing technologies.